These days online businesses are suffering a lot of difficulty in getting e-Commerce shoppers to go through checkout process. This is incredibly frustrating to e-Commerce website owners who want to make the checkout process easiest in order to increase sales. The only way to do this is through a easy checkout process. A one page checkout is therefore, highly recommended to allow e-Commerce shoppers to checkout in a short period of time. Is your Checkout process killing your sales? No need to worry, as Velocity, a leading name in e-Commerce design and development, is offering smartest and fastest One Page checkout extension for Opencart. The functionalities and performance features of this innovative module allows e-Commerce businesses to excel rapidly by an increase in sales target. 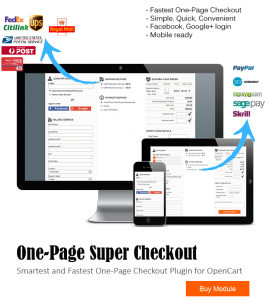 Opencart One Page checkout is designed to reduce shopping cart abandonment rate. It is a faster, smarter and better checkout page that replaces default checkout with its advanced features. This module reduces the time needed to checkout as well as the personal information that is collected. When customers see that their e-Commerce experience is going to get completed on a single page only, they are more likely to finish up the transaction. One page checkout allows customers to login through their Facebook or Google account. In this situation, customers who are worried about lengthy registration process, happily complete the transaction on your store. This feature really increases the convenience of the customers as they don’t need to remember password anymore and can login store with a single click. Feature Rich Admin Panel- In order to administer the website’s functionality, it is necessary to have a good control over your web account. The feature-rich admin control allows you to manage the layout, design and content of your website. With easy and quick Content Management System (CMS) it becomes easy for the admin to define the presentation of checkout page. It allows you to modify the design, layout and theme option available for admin panel. Admin is also capable to show/hide any field, also he can set any field to be mandatory. Multiple design layout- Single page checkout include both the product information and checkout information on a single page. In order to increase consumer usability, table style layout is recommended for placing checkout information. The layout designs are mainly segregated as 1 Column, 2 Column or 3 Column. With the help of this feature, you can easily choose the size, design or layout you want for your checkout page. Social Media login- The availability of social media options as Google+ and Facebook for customers while checking out, simplifies the process of checkout, thereby eliminates the chances of loss in sales. Customers who visit the site as Guest and attempts to shop can also login immediately for continuing the checkout process, whereas registered customers can also opt this method. Option to add HTML content- With this attractive feature, it becomes easy to add any image, text or link anywhere on the checkout page. Mobile Responsive- One of the most essential feature of “One page checkout” is its being highly responsive that helps in capturing more sales. With over 50% of traffic in e-Commerce sites that is coming from smart phones and tablets, it has become important for online stores to design a responsive web feature. Responsive checkout is designed to adapt to a layout optimized specifically for the screen size your customer is using. With responsive checkout customers get the best checkout experience possible. Detailed information of product along with the image- One page checkout also provide a section wherein customers can view the purchase details completely along with the image, number and name of product to shop. “Mouse over preview” feature allows customer to view the image of the product. Besides, with “order confirmation”, customers also get a chance to update the number of items to be purchased. Customers can also shop further by applying coupon/ voucher code. An interesting feature of checkout is that , here customers can view the entire purchasing details with “shipping charges”, “tax applied”, “order total” and so on.